Winning a Super Bowl is career-defining for players, coaches and front office executives. Jon Gruden led Tampa to a SB win in 2002. Amazingly, that is his last playoff win and somehow we’re still sure he’s a brilliant coach. You really need context to truly understand what a Super Bowl title means. You need to see what happens after a championship to find out if that was an anomaly or part of an extended run of success. We can try to judge Doug Pederson and the Eagles right now, but we don’t have all the facts. He could turn out to be a football genius that will have a lasting impact on the game. Or he could be Mike McCarthy, a coach who won it all, but largely did so because he had the right players at the right time. I think Pederson is a special coach, but we won’t know for sure until some time has gone by. I wrote a piece on the challenge of sustaining success for PE.com. If Pederson can keep the Eagles winning, he will carve out a piece of football history. Having an elite QB like Carson Wentz gives him a chance to be part of something special. When you factor in Pederson’s gameplanning ability and leadership skills, it sure feels like good things are going to happen. One other aspect of sustaining success is having the right guys finding talent. This could give the Eagles another advantage. The Eagles have a terrific scouting staff, led by Joe Douglas and Andy Weidl. They have helped to stock the roster with young talent. The Eagles don’t win it all last year without rookies Derek Barnett and Corey Clement. 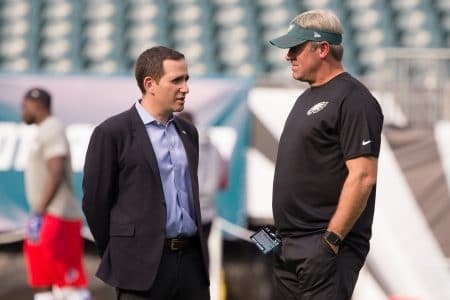 Here's the exciting news for Eagles fans– They've built the best scouting department in the NFL. They are going to keep adding to this talent base. Dwayne Joseph and his pro personnel staff have hit some major home runs in free agency, both with big money players and bargain buys. From Alshon Jeffery to Bryan Braman, veteran additions came up huge last season. Howie Roseman gives the team an X-factor with his ability to make trades and creatively find talent. No one thought the Eagles would be adding Michael Bennett this offseason. Moving back to the middle of the second round and still getting Dallas Goedert? I would never have guessed that possible. Roseman and Pederson are very much on the same page right now and that makes a huge difference. There is no fight for control of the team. Everyone does their job and they get to share in the glory. That may change down the road, but this is a united organization right now and that should help the Eagles to keep winning.